Day 1 is in the can! A good steady stream of people all day. There wasn't a huge # of people in the booth (less than I expected), but our theatre presentations were well attended and it seemed we always had a least one customer at the XPS station. Hard to figure out any theme in all the people we met today. Overall I think we did a good job of sticking the term 'XPS' in people's heads who had never heard of it - and, for people that had heard of it, the demos showed that it was real and coming. In fact many comments were along the lines of 'when can we have it'. 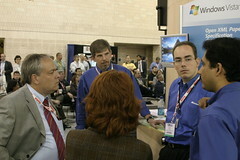 We spent a lot of effort showing how well XPS is integrated into Windows RMS, Office 2007 and Sharepoint. 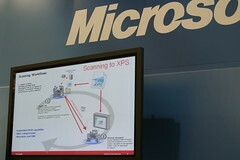 I think it was harder to tell the story about the basic nature of XPS, how at a file format level it is architected to be easy to build systems around, how it shares the same container architecture with Office 2007 and what that really means to people that want to build systems that programaticly interact with documents. Still some work to get that mesaging very clear to the outside world. Tomorrow we have our general sessions that I hope are well attended. Seems like the weather, a well-timed cab stike and all the keynote speaches conpsired to keep exhibit attendance a little lower today. Tomorrow should be stronger. What is Xerox saying about XPS – will Xerox FreeFlow consume and or "process" XPS files – is there a tie in with JDF and XPS, or is JDF simply unnecessary, as one can set up automatic processing using another method (you know, where i say "this is a 10 page document, please print 5 copies, collated and on both sides of the paper"?